International Journal of Research in Health Sciences,2015,3,1,140-145. 1-Associate Professor, Department of Pharmacology, Andhra Medical College, Visakhapatnam, A.P. 2-M. Pharmacy, PhD, AU College of Pharmaceutical Sciences, Andhra University, Visakhapatnam, A.P., INDIA. Stroke is one of the leading causes of the death worldwide these days. About 1/5th of patients with an acute stroke die within a month of event and at least 1/2nd of those who survive are left with physical disability. Identification and management of risk factors remains pivotal in reducing morbidity and mortality from stroke. Methods: A retrospective study was conducted with the objective of identifying various risk factors for stroke and assesses the awareness of the risk factors for stroke. Results: The mean age of the patients was 59±13.06 (range 25 to 90 years). There were 73 males (mean age 60.16±13.07) and 23 females (mean age 54.25±79). 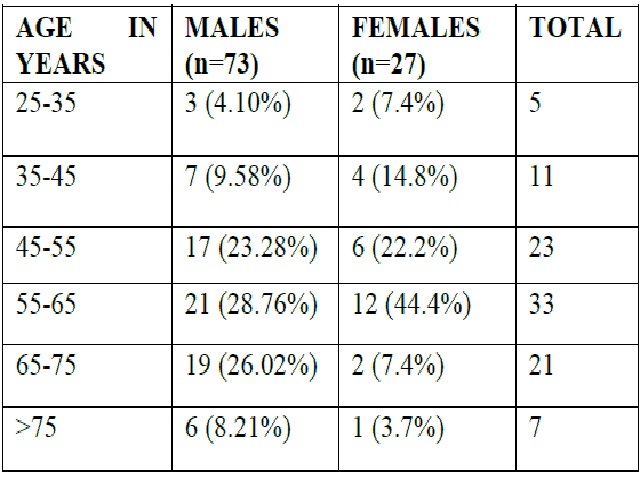 33% patients (21 males and 12 females) were in the age group of 55-65 years. On analysis of risk factors according to the type of stroke, hypertension still remained the most common risk factor for both ischemic and hemorrhagic stroke. This study reveals hypertension as the most common risk factor for stroke followed by smoking, Diabetes Mellitus and Dyslipidemia. The knowledge of the risk factors for stroke in stroke survivors was also very low and the knowledge varied among the subjects depending on their level of education. Conclusion: Our findings strongly recommend that effective control of blood pressure, blood glucose and smoking may be important avenues for stroke prevention in this population.